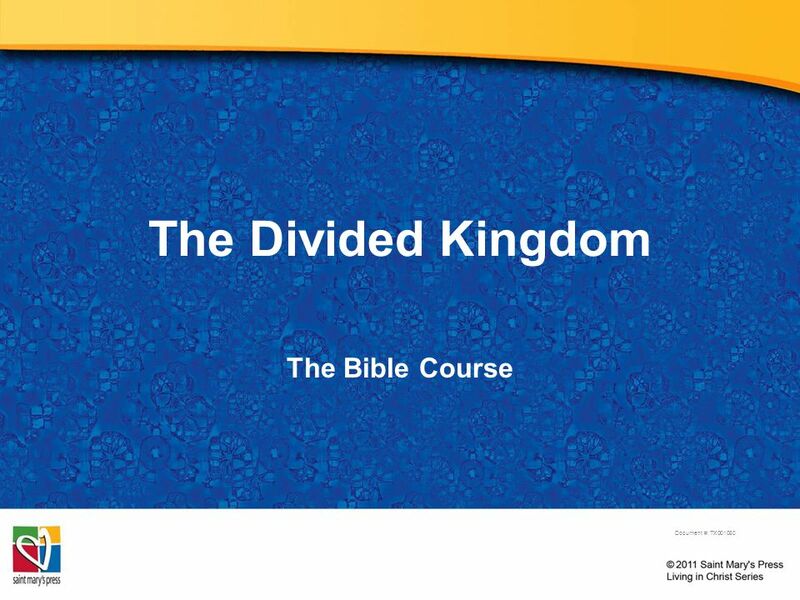 The Divided Kingdom The Bible Course Document #: TX001080. 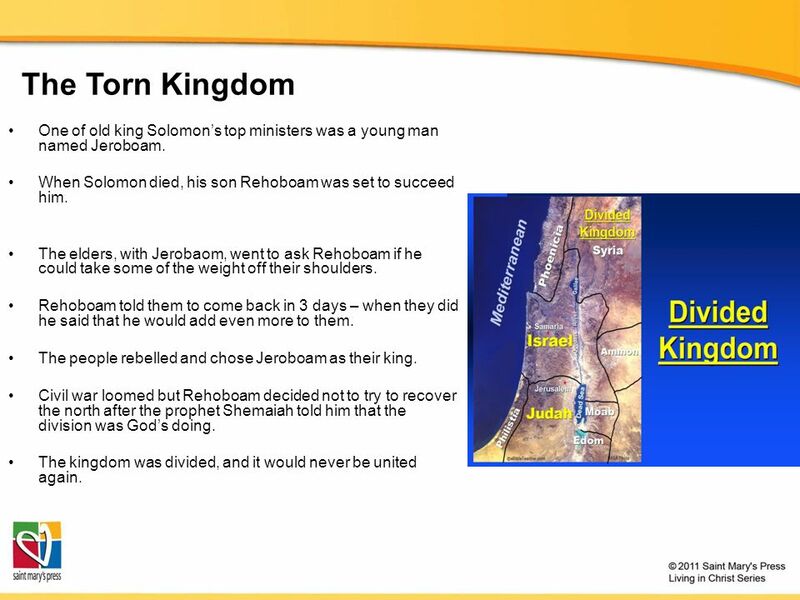 2 The Torn Kingdom One of old king Solomon’s top ministers was a young man named Jeroboam. When Solomon died, his son Rehoboam was set to succeed him. The elders, with Jerobaom, went to ask Rehoboam if he could take some of the weight off their shoulders. Rehoboam told them to come back in 3 days – when they did he said that he would add even more to them. 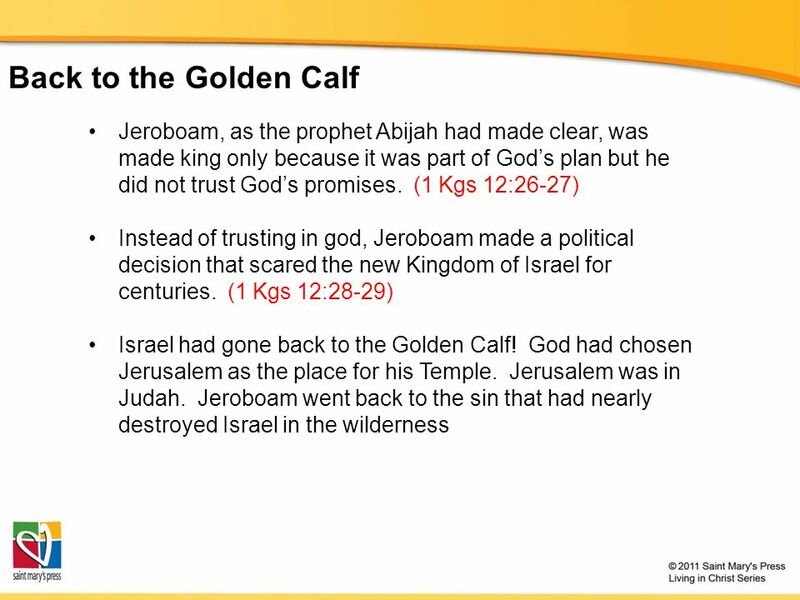 The people rebelled and chose Jeroboam as their king. Civil war loomed but Rehoboam decided not to try to recover the north after the prophet Shemaiah told him that the division was God’s doing. The kingdom was divided, and it would never be united again. 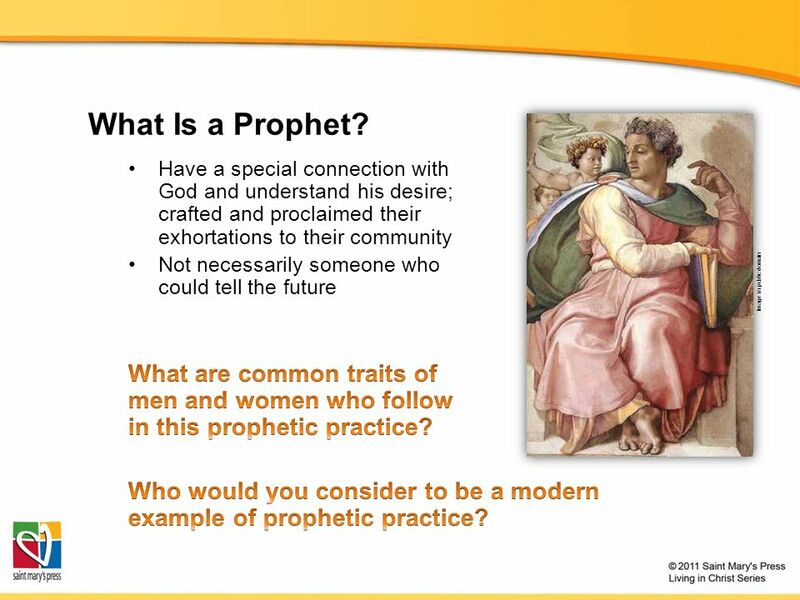 9 How Are the Prophets Different From One Another? 13 Jonah Jonah went to Ninevah and proclaimed to the people what God had told him to say: “Yet 40 days, and Ninevah shall be overthrown.” 40 day is symbolic time for serious repentance. 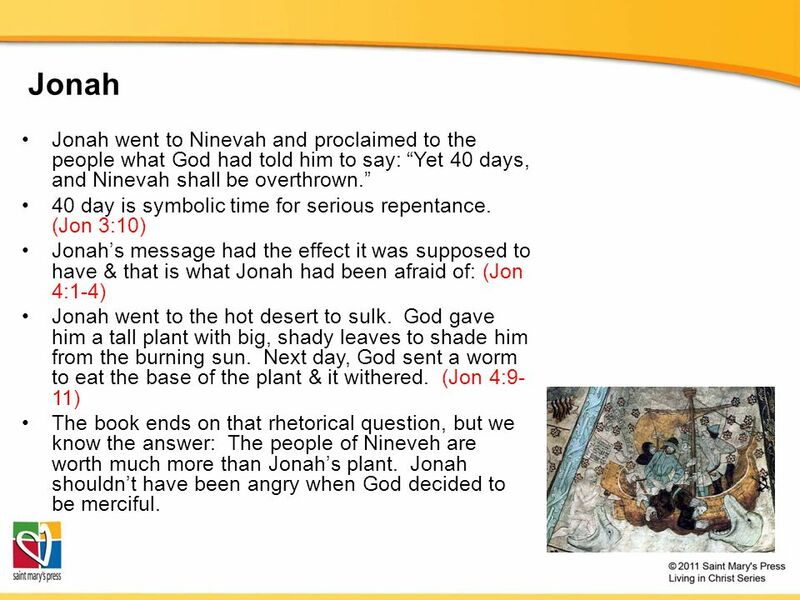 (Jon 3:10) Jonah’s message had the effect it was supposed to have & that is what Jonah had been afraid of: (Jon 4:1-4) Jonah went to the hot desert to sulk. God gave him a tall plant with big, shady leaves to shade him from the burning sun. Next day, God sent a worm to eat the base of the plant & it withered. (Jon 4:9- 11) The book ends on that rhetorical question, but we know the answer: The people of Nineveh are worth much more than Jonah’s plant. Jonah shouldn’t have been angry when God decided to be merciful. 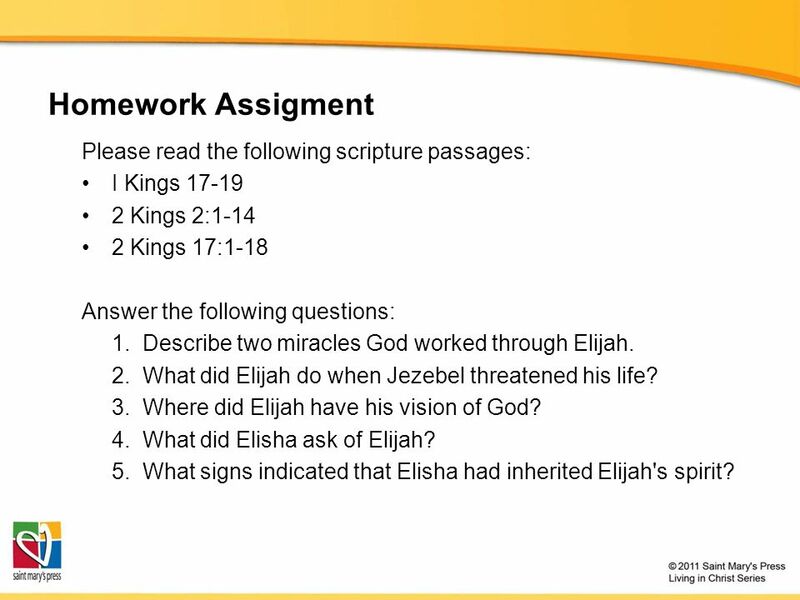 14 Homework Assigment Please read the following scripture passages: I Kings 17-19 2 Kings 2:1-14 2 Kings 17:1-18 Answer the following questions: 1. Describe two miracles God worked through Elijah. 2. 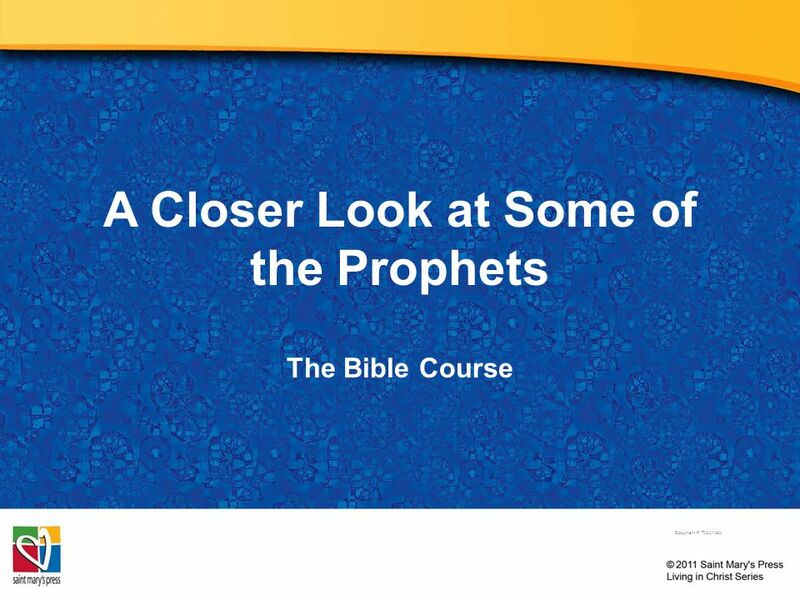 What did Elijah do when Jezebel threatened his life? 3. Where did Elijah have his vision of God? 4. What did Elisha ask of Elijah? 5. 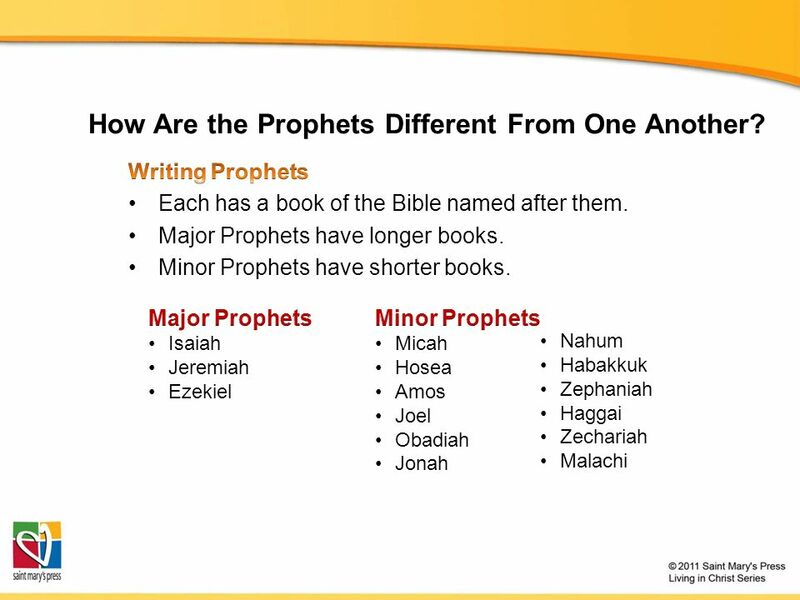 What signs indicated that Elisha had inherited Elijah's spirit? 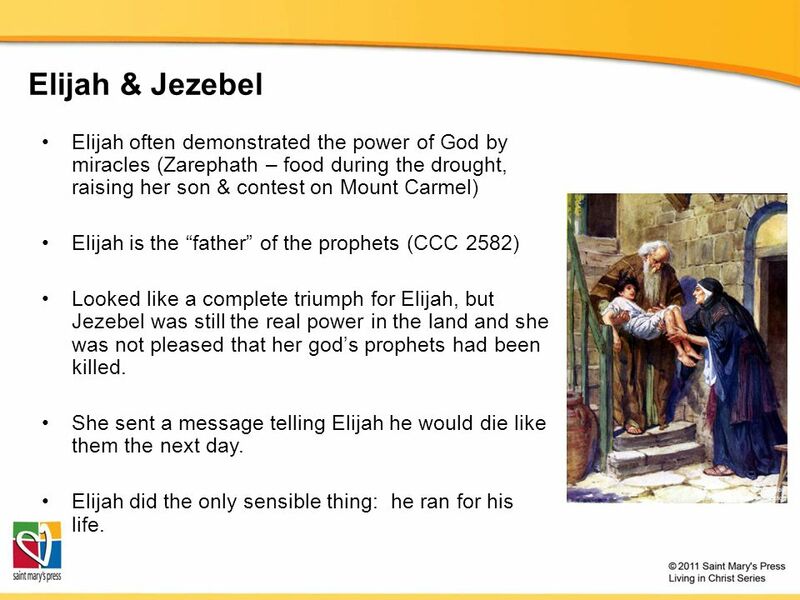 15 Elijah & Jezebel Of all the wicked kings of Israel, the most remembered is Ahab – he is remembered more for the woman he married (Jezebel) Jezebel persuaded her husband to worship Baal. 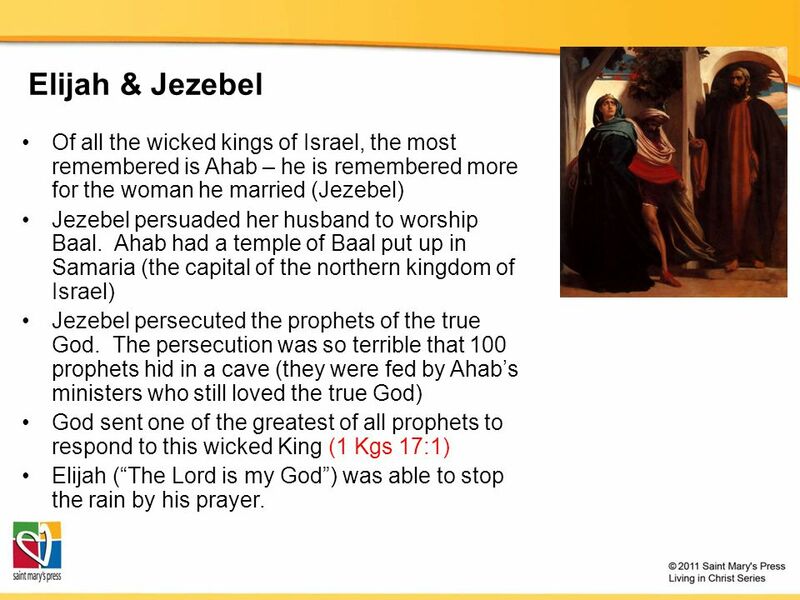 Ahab had a temple of Baal put up in Samaria (the capital of the northern kingdom of Israel) Jezebel persecuted the prophets of the true God. 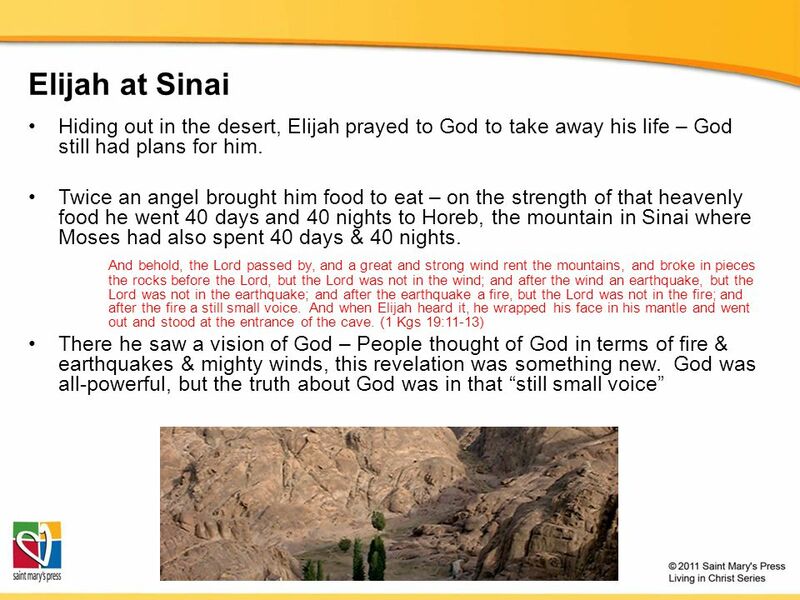 The persecution was so terrible that 100 prophets hid in a cave (they were fed by Ahab’s ministers who still loved the true God) God sent one of the greatest of all prophets to respond to this wicked King (1 Kgs 17:1) Elijah (“The Lord is my God”) was able to stop the rain by his prayer. 16 Elijah & Jezebel Elijah often demonstrated the power of God by miracles (Zarephath – food during the drought, raising her son & contest on Mount Carmel) Elijah is the “father” of the prophets (CCC 2582) Looked like a complete triumph for Elijah, but Jezebel was still the real power in the land and she was not pleased that her god’s prophets had been killed. She sent a message telling Elijah he would die like them the next day. Elijah did the only sensible thing: he ran for his life. 18 Elijah and Elisha At Horeb, God told Elijah to anoint a new prophet to take his place. Elijah found Elisha plowing the field. He tossed his mantle over Elisha, showing that Elisha would take over his prophetic call. Elisha took a hasty leave of his people and followed. Time came for Elijah to be taken away. Elisha asked for “double share of your spirit” – a “double share” was the inheritance of a first-born son. Elisha was asking to be made Elijah’s heir and successor. When they had crossed, Elijah said to Elisha, “Ask what I shall do for you, before I am taken from you.” And Elisha said, “I pray you, let me inherit a double share of your spirit.” And he said, “You have asked a hard thing; yet, if you see me as I am being taken from you, it shall be so; but if you do not see me, it shall not be so.” And as they still went on and talked, behold, a chariot of fire and horses of fire separated the two of them. And Elijah went up by a whirlwind into heaven. And Elisha saw it and he cried, “My father, my father! The chariots of Israel and its horsemen!” And he saw him no more. 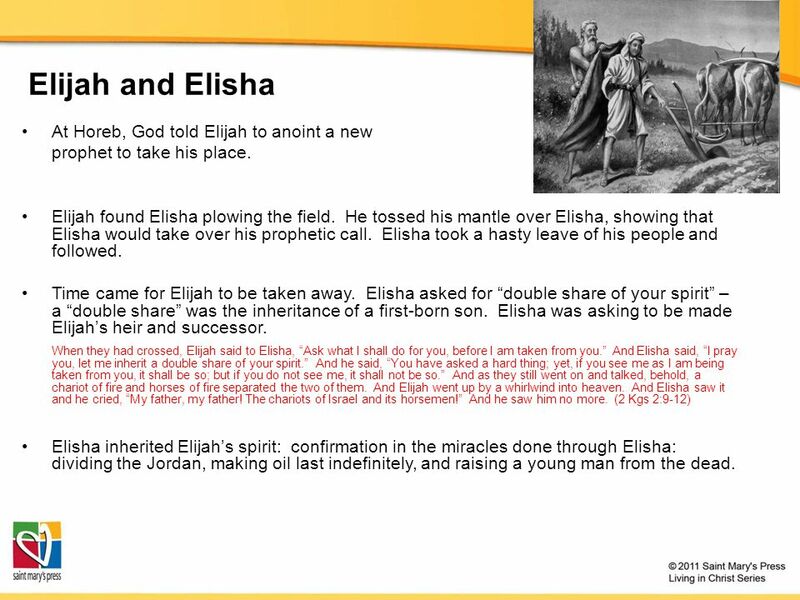 (2 Kgs 2:9-12) Elisha inherited Elijah’s spirit: confirmation in the miracles done through Elisha: dividing the Jordan, making oil last indefinitely, and raising a young man from the dead. 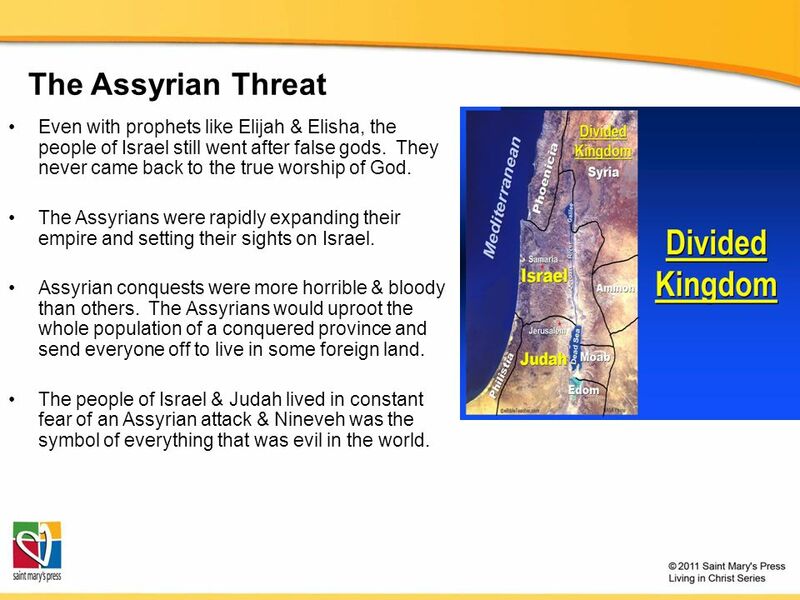 19 The Assyrian Threat Even with prophets like Elijah & Elisha, the people of Israel still went after false gods. They never came back to the true worship of God. 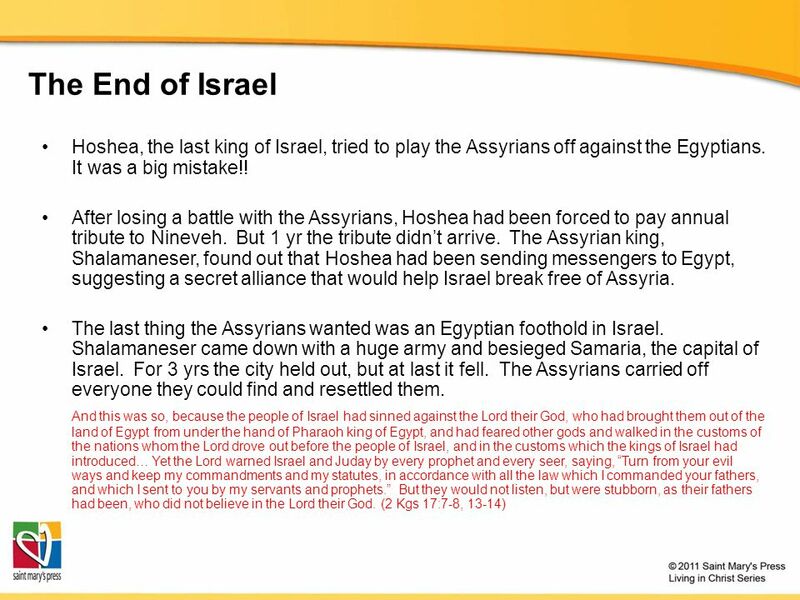 The Assyrians were rapidly expanding their empire and setting their sights on Israel. Assyrian conquests were more horrible & bloody than others. The Assyrians would uproot the whole population of a conquered province and send everyone off to live in some foreign land. The people of Israel & Judah lived in constant fear of an Assyrian attack & Nineveh was the symbol of everything that was evil in the world. 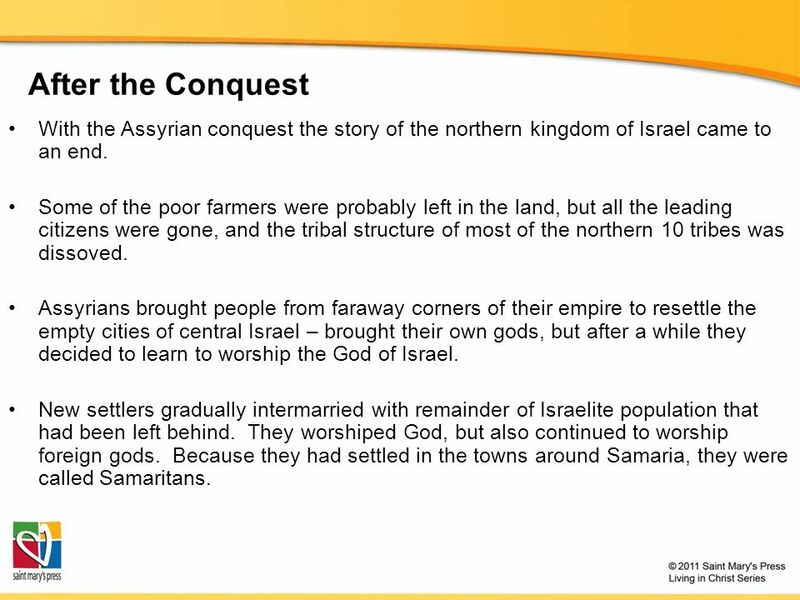 21 After the Conquest With the Assyrian conquest the story of the northern kingdom of Israel came to an end. Some of the poor farmers were probably left in the land, but all the leading citizens were gone, and the tribal structure of most of the northern 10 tribes was dissoved. Assyrians brought people from faraway corners of their empire to resettle the empty cities of central Israel – brought their own gods, but after a while they decided to learn to worship the God of Israel. New settlers gradually intermarried with remainder of Israelite population that had been left behind. They worshiped God, but also continued to worship foreign gods. Because they had settled in the towns around Samaria, they were called Samaritans. 23 Isaiah All that was left of David’s kingdom was Judah (included the large tribe of Judah, the little tribe of Benjamin & the Levites who had not lived in Israel) While Israel was coming to an end, Judah was going through a rebirth with a good king Hezekiah who was determined to what was right in the sight of God. 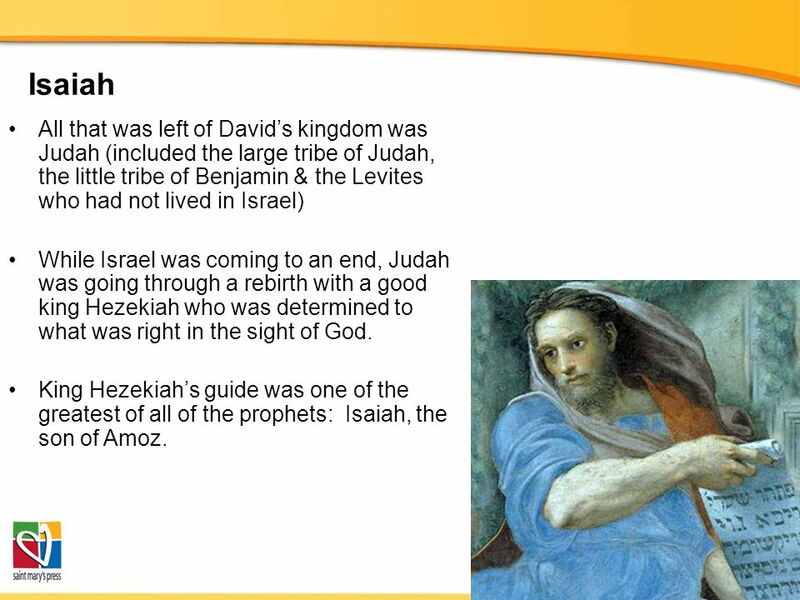 King Hezekiah’s guide was one of the greatest of all of the prophets: Isaiah, the son of Amoz. 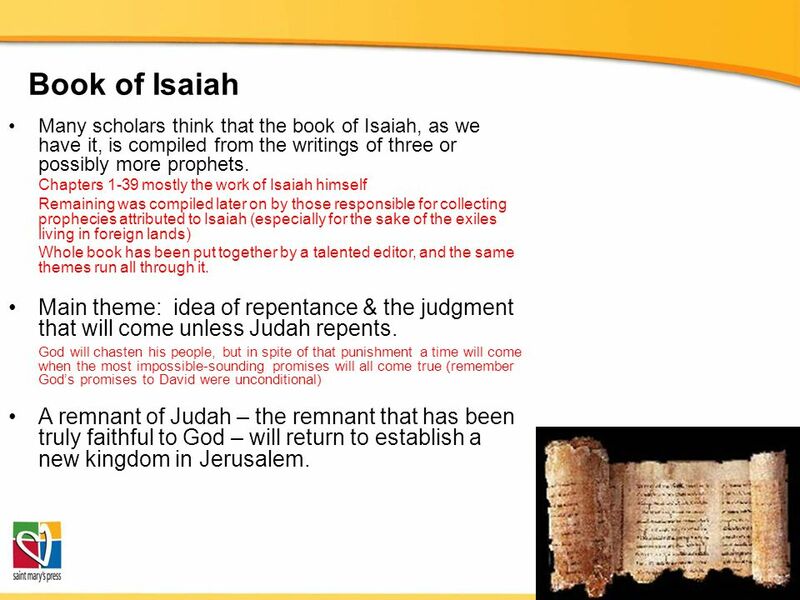 25 Book of Isaiah Many scholars think that the book of Isaiah, as we have it, is compiled from the writings of three or possibly more prophets. 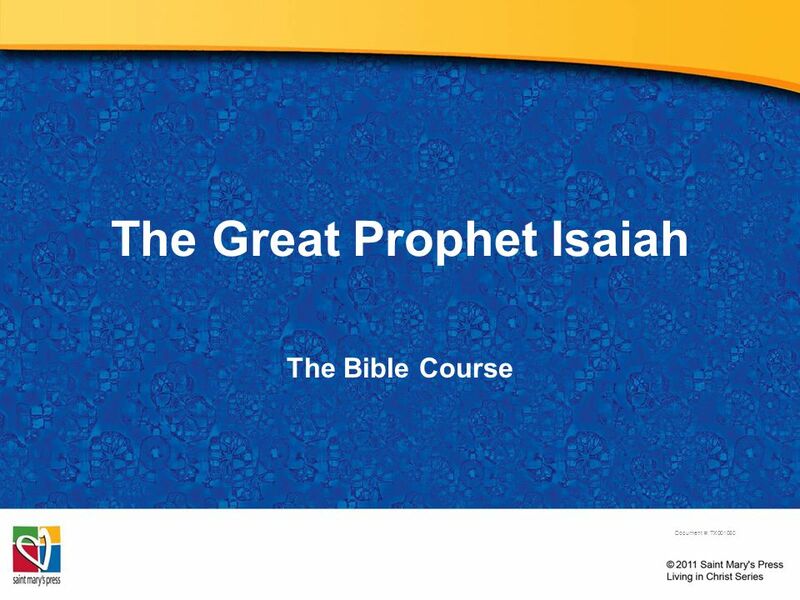 Chapters 1-39 mostly the work of Isaiah himself Remaining was compiled later on by those responsible for collecting prophecies attributed to Isaiah (especially for the sake of the exiles living in foreign lands) Whole book has been put together by a talented editor, and the same themes run all through it. 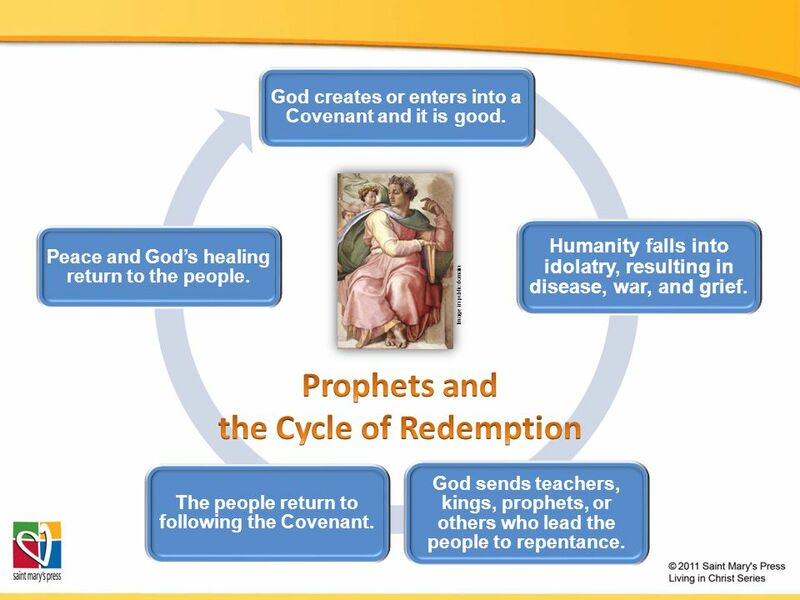 Main theme: idea of repentance & the judgment that will come unless Judah repents. 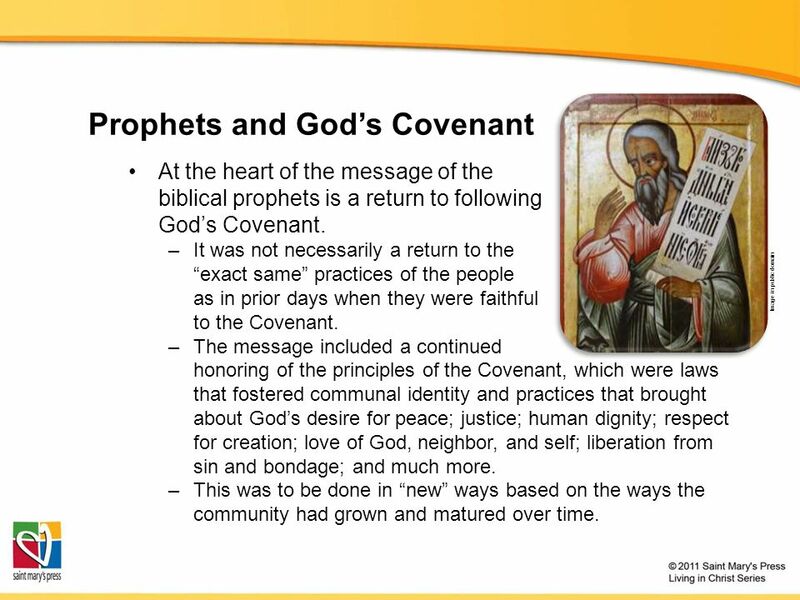 God will chasten his people, but in spite of that punishment a time will come when the most impossible-sounding promises will all come true (remember God’s promises to David were unconditional) A remnant of Judah – the remnant that has been truly faithful to God – will return to establish a new kingdom in Jerusalem. 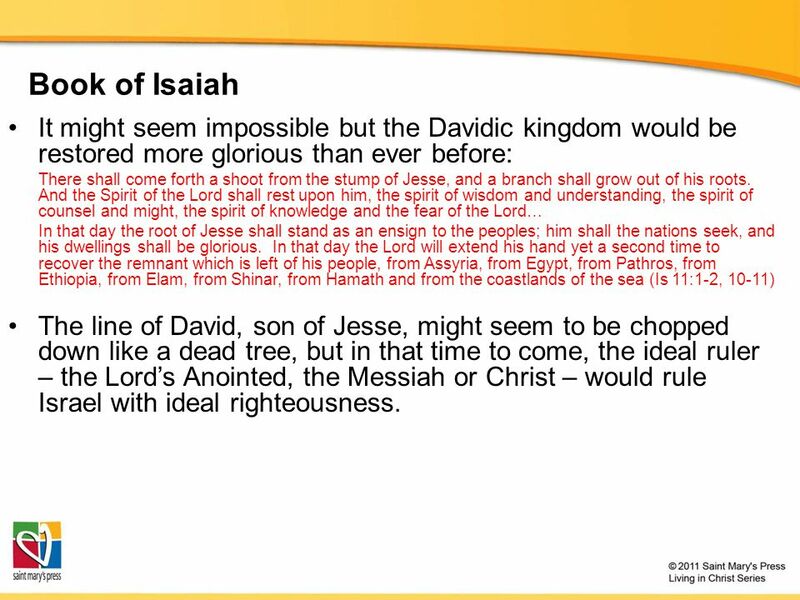 26 Book of Isaiah It might seem impossible but the Davidic kingdom would be restored more glorious than ever before: There shall come forth a shoot from the stump of Jesse, and a branch shall grow out of his roots. And the Spirit of the Lord shall rest upon him, the spirit of wisdom and understanding, the spirit of counsel and might, the spirit of knowledge and the fear of the Lord… In that day the root of Jesse shall stand as an ensign to the peoples; him shall the nations seek, and his dwellings shall be glorious. In that day the Lord will extend his hand yet a second time to recover the remnant which is left of his people, from Assyria, from Egypt, from Pathros, from Ethiopia, from Elam, from Shinar, from Hamath and from the coastlands of the sea (Is 11:1-2, 10-11) The line of David, son of Jesse, might seem to be chopped down like a dead tree, but in that time to come, the ideal ruler – the Lord’s Anointed, the Messiah or Christ – would rule Israel with ideal righteousness. 27 Book of Isaiah In the reign of Ahaz, the Assyrians attacked Jerusalem, and it looked like the end for Judah. God sent Isaiah with a message for Ahaz. “Ask for a sign of the Lord your God; let it be deep as Sheol or high as heaven.” But Ahaz said, “I will not ask, and I will not put the Lord to the test.” And he [Isaiah] said, “Hear then, O house of David! Is it too little for you to weary men, that you weary my God also? Therefore the Lord himself shall give you a sign. Behold, a young woman shall conceive and bear a son, and shall call his name Immanuel [that is, God-Is-With-Us]. He shall eat curds and honey when he knows how to refuse the evil and choose the good. 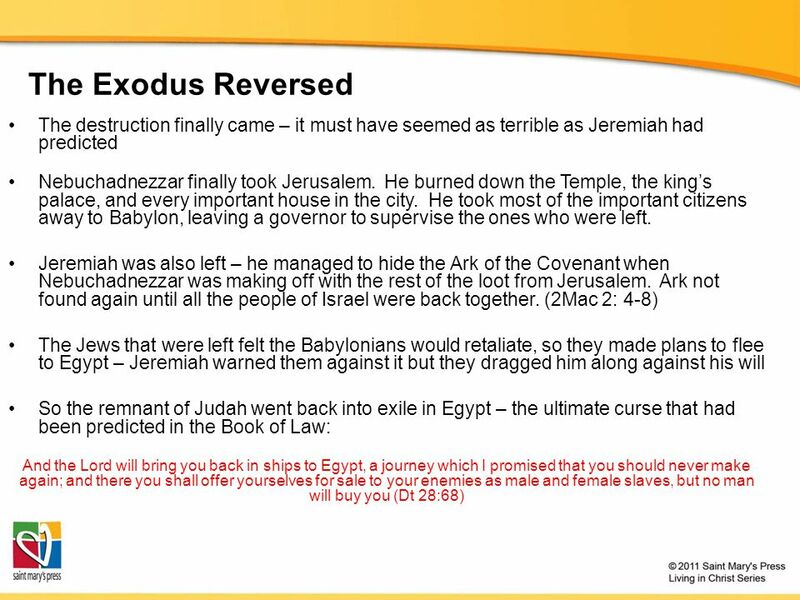 For before the child knows how to refuse the evil and choose the good, the land before those two kings are in dread will be deserted (Is 7:10-16) Ahaz has a son (Hezekiah) and it seemed like the beginning of the fulfillment of the promise. 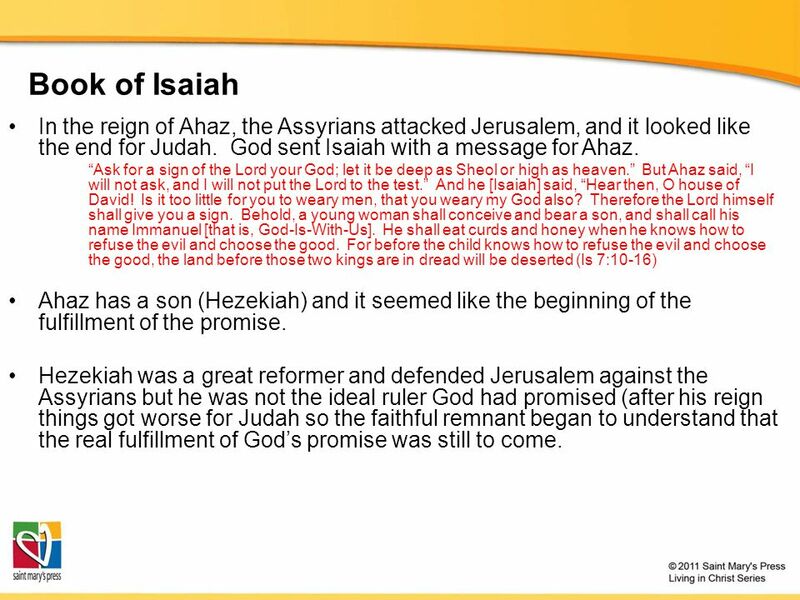 Hezekiah was a great reformer and defended Jerusalem against the Assyrians but he was not the ideal ruler God had promised (after his reign things got worse for Judah so the faithful remnant began to understand that the real fulfillment of God’s promise was still to come. 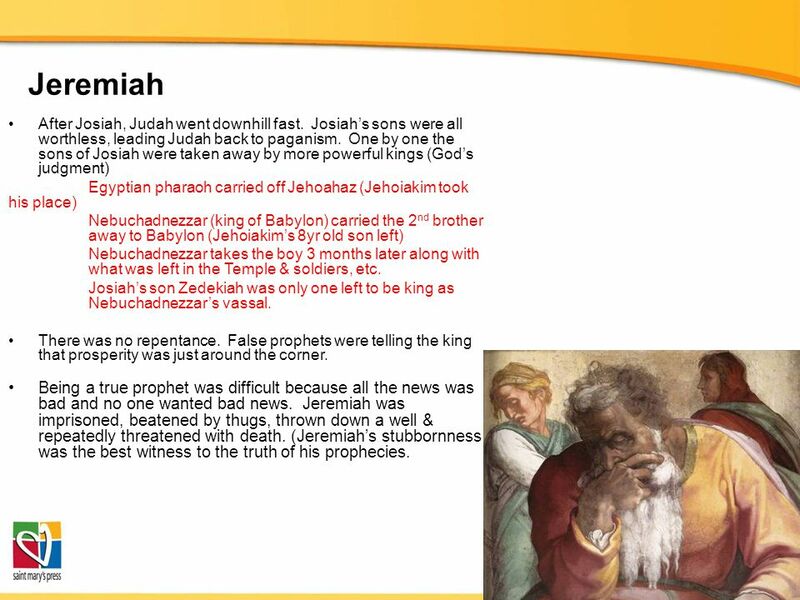 29 Jeremiah After Josiah, Judah went downhill fast. 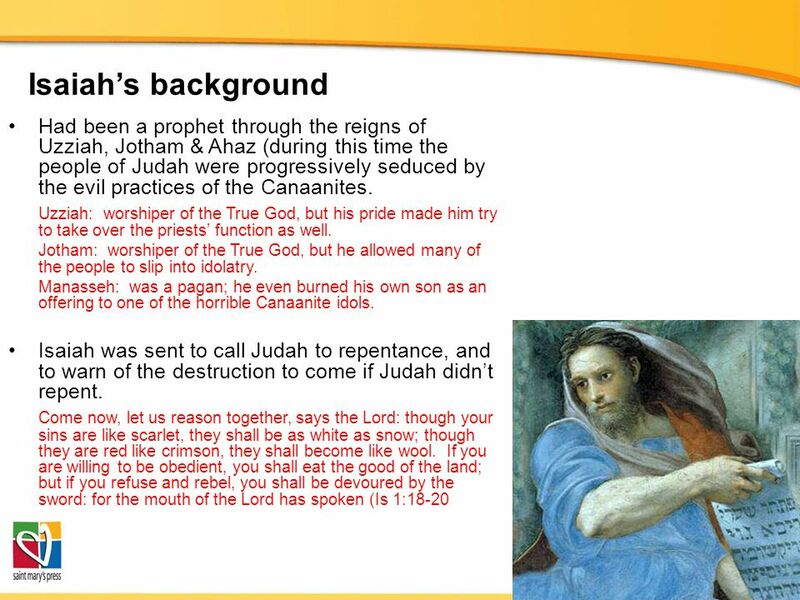 Josiah’s sons were all worthless, leading Judah back to paganism. One by one the sons of Josiah were taken away by more powerful kings (God’s judgment) Egyptian pharaoh carried off Jehoahaz (Jehoiakim took his place) Nebuchadnezzar (king of Babylon) carried the 2 nd brother away to Babylon (Jehoiakim’s 8yr old son left) Nebuchadnezzar takes the boy 3 months later along with what was left in the Temple & soldiers, etc. Josiah’s son Zedekiah was only one left to be king as Nebuchadnezzar’s vassal. There was no repentance. False prophets were telling the king that prosperity was just around the corner. 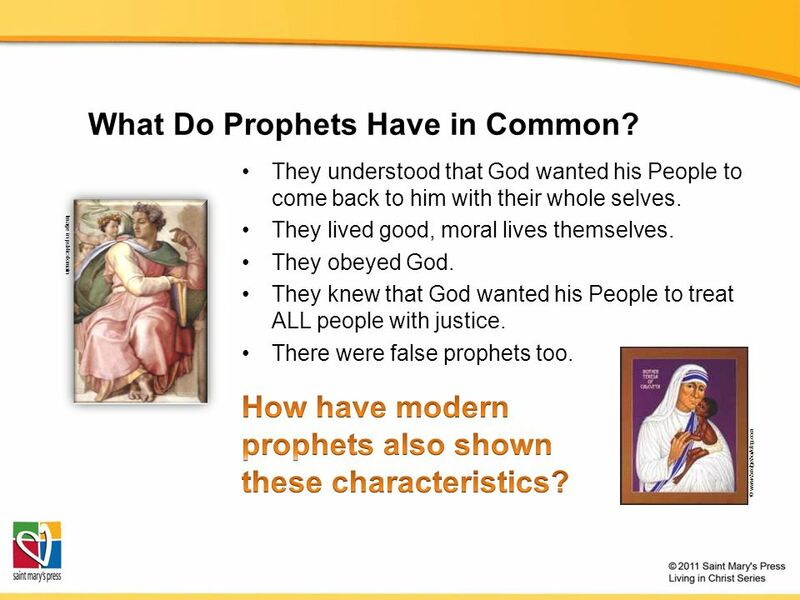 Being a true prophet was difficult because all the news was bad and no one wanted bad news. Jeremiah was imprisoned, beatened by thugs, thrown down a well & repeatedly threatened with death. 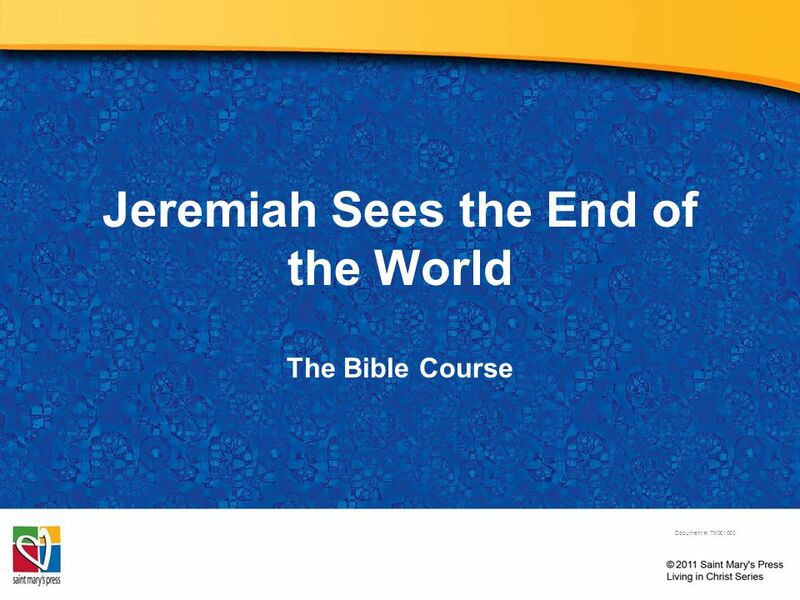 (Jeremiah’s stubbornness was the best witness to the truth of his prophecies. 30 Jeremiah Zedekiah decided to rebel against Nebuchadnezzar (relying on help from Egypt) – he didn’t learn from the mistakes of Hoshea) The false prophets promised him that Egypt would save Judah – Jeremiah told him that Egypt would do him no good (God had already determined the fate of Jerusalem) Thus says the Lord, Do not deceive yourselves, saying “The Chaldeans will surely stay away from us,” for they will not stay away. For even if you should defeat the whole army of Chaldeans who are fighting against you, and there remained of them only wounded men, every man in his tent, they would rise up and burn this city with fire. 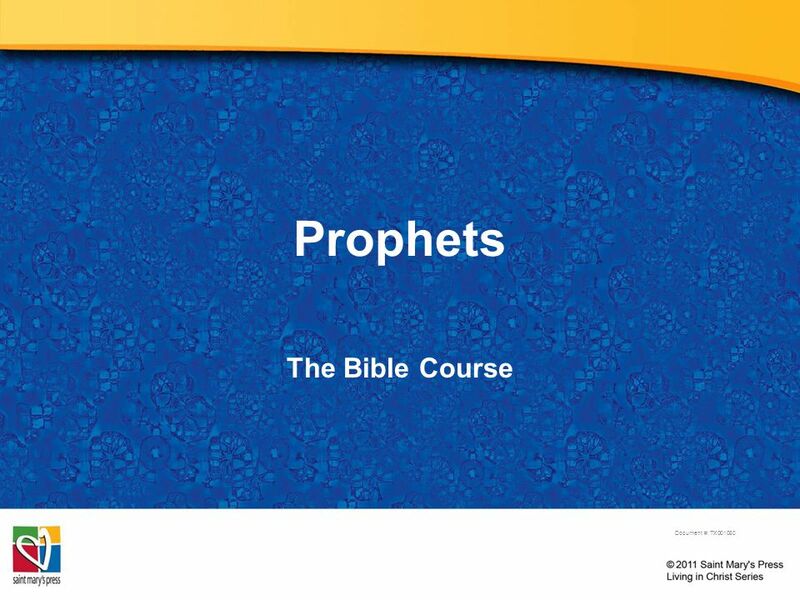 (Jer 37:9-10) Jeremiah was a powerful figure in spite of his unpopularity (he was known for giving prophecies against the reigning authority, yet the king felt compelled to consult him rather than a compliant prophet. 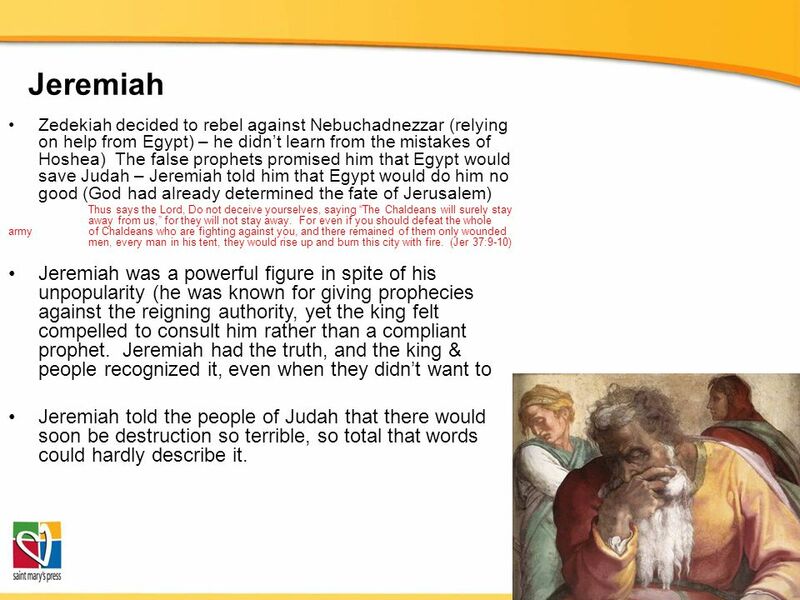 Jeremiah had the truth, and the king & people recognized it, even when they didn’t want to Jeremiah told the people of Judah that there would soon be destruction so terrible, so total that words could hardly describe it. 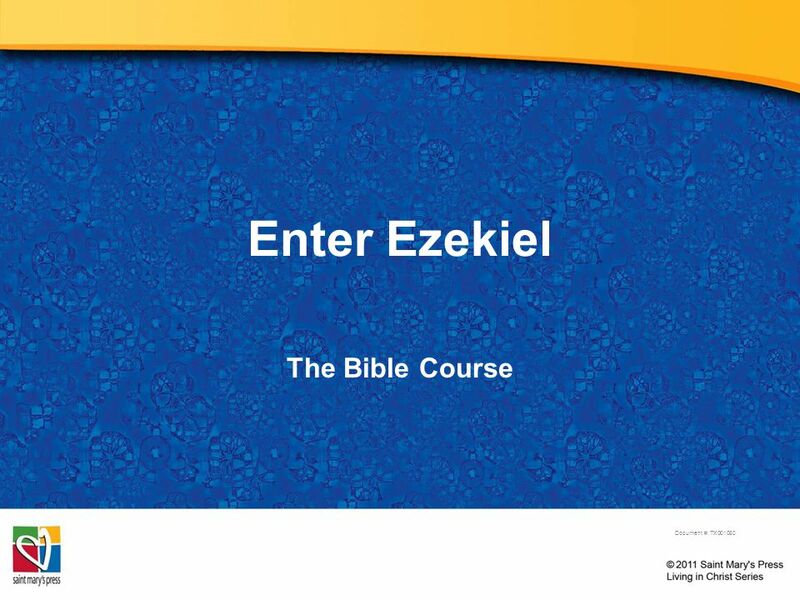 33 Ezekiel Ezekiel lived at the same time as Jeremiah. 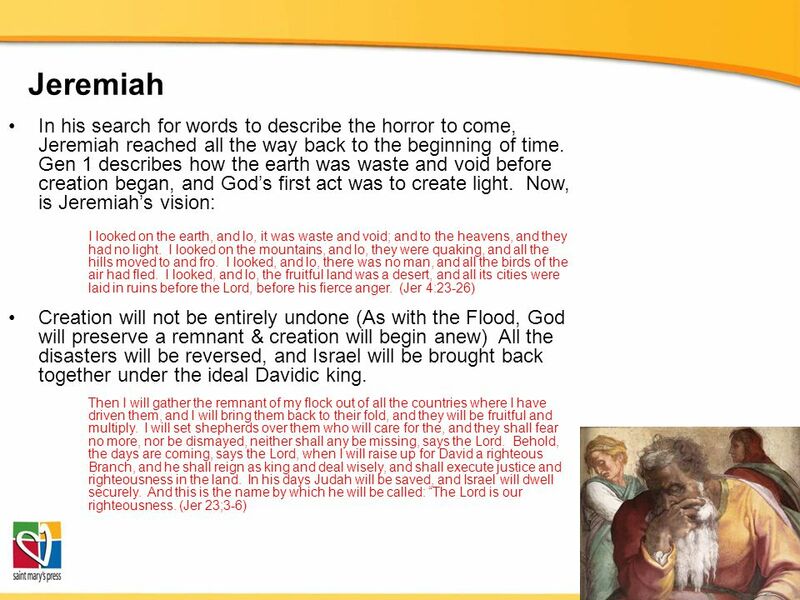 He also foresaw terrible destruction ahead but no matter how terrible the destruction might seem, in the more distant future God would redeem his people. For I will take you from the nations, and gather you from all the countries, and bring you into your own land. I will sprinkle clean water upon you, and you shall be clean from all your uncleannesses, and from all your idols I will cleanse you. A new heart I will give you, and a new spirit I will put within you; and I will take out of your flesh the heart of stone and give you a heart of flesh I will put my spirit within you, and cause you to walk in my statutes and be careful to observe my ordinances. You shall dwell in the land which I gave to your fathers; and you shall be my people, and I will be your God. (Ez 36:24-28) The terrible punishment to come was not revenge, but the discipline of a loving Father. The redemption to come after that would not come because Israel deserved it, but purely become of God’s love. Then you will remember your evil ways, and your deeds that were not good; and you will loathe yourselves for your iniquities and your abominable deeds. It is not for your sake that I will act, says the Lord God; let that be known to you. Be ashamed and confounded for your ways, O Israel. (Ez 36:31-32) The Prophet Ezekiel will be among the Jews who will be deported from Jerusalem to Babylon. 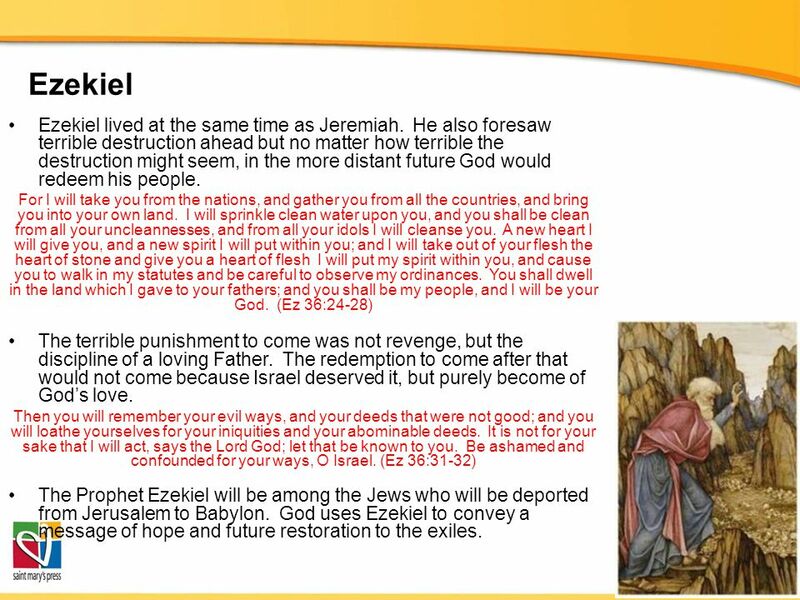 God uses Ezekiel to convey a message of hope and future restoration to the exiles. 35 The Babylonian Exile Jerusalem had meant everything to the people of Judah (God’s chosen dwelling out of all the earth) – now the city was burned, and the Promised Land had been taken away. The Temple was gone. Babylon was a huge city, a place where Nebuchadnezzar sat among immense palaces and temples and ruled the world, and a place where all the vices of the world were collected. (magnificent & terrible) Difficult for the people of Judah who had been carried away yet a strange thing happened: depriving them of everything they owned, helped them remember God. (surrounded by all these false gods they began to understand the value of what they lost – they began to remember they were the chosen people of God) Many of the books of the Old Testament were edited in their final forms during the Babylonian Exile – Thrown out of their homes, carried away to foreign slavery, they wrote the history of how their people lost everything – they knew why they had lost it they had been unfaithful to their God. 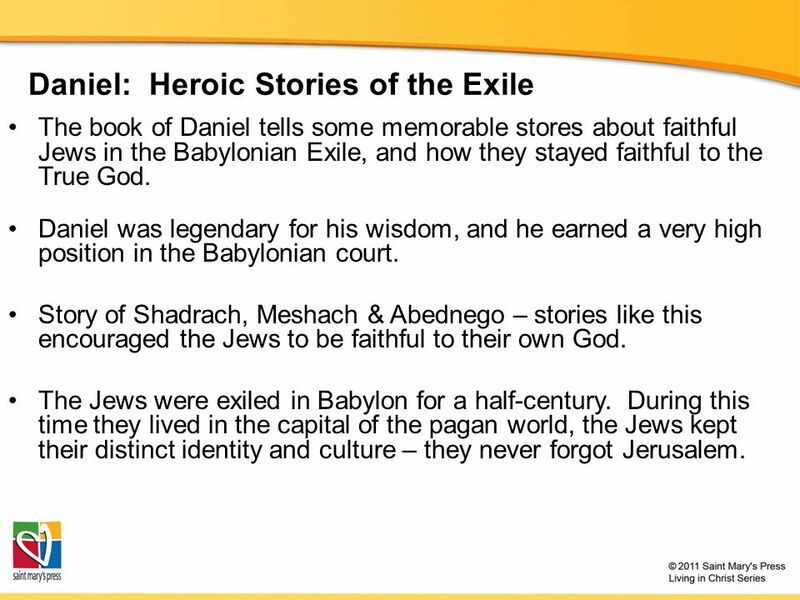 36 Daniel: Heroic Stories of the Exile The book of Daniel tells some memorable stores about faithful Jews in the Babylonian Exile, and how they stayed faithful to the True God. Daniel was legendary for his wisdom, and he earned a very high position in the Babylonian court. Story of Shadrach, Meshach & Abednego – stories like this encouraged the Jews to be faithful to their own God. 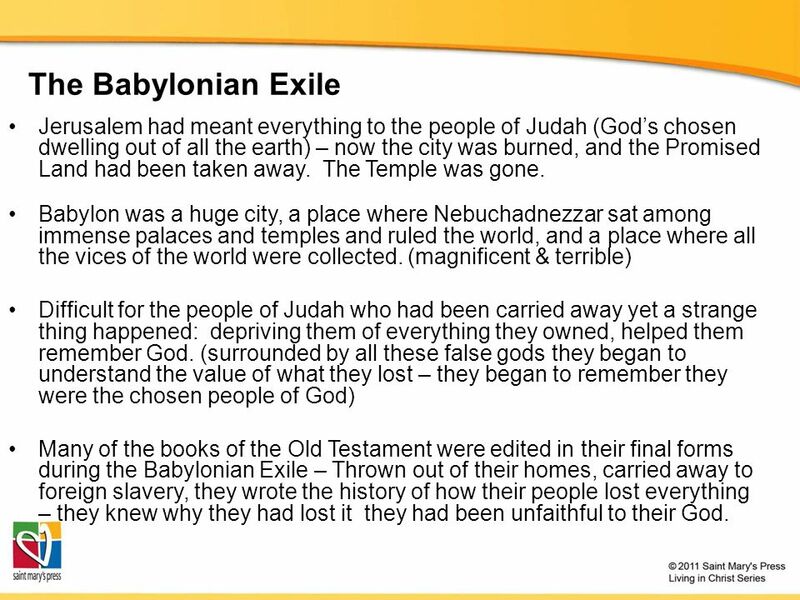 The Jews were exiled in Babylon for a half-century. During this time they lived in the capital of the pagan world, the Jews kept their distinct identity and culture – they never forgot Jerusalem. 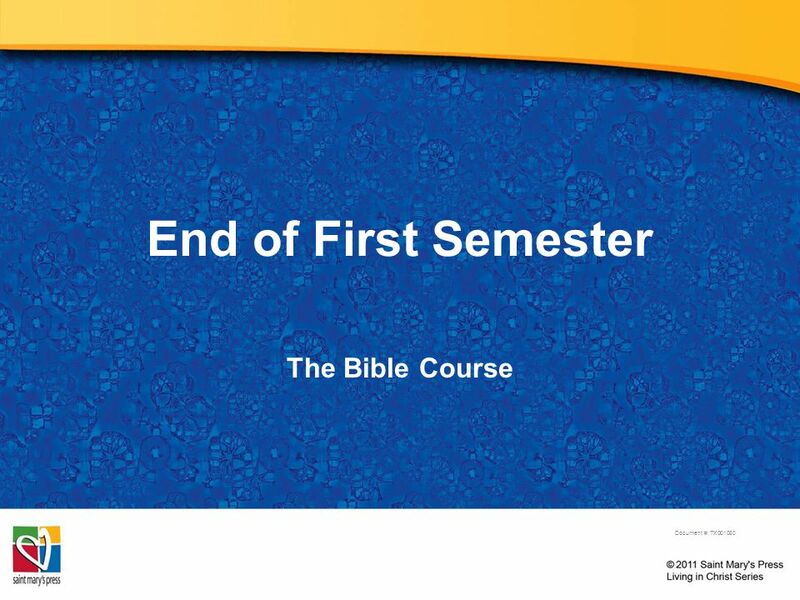 Download ppt "The Divided Kingdom The Bible Course Document #: TX001080." The Jesse Tree. What is a Jesse tree This is meant to be used during Advent It is a way of preparing for the coming of Jesus into our world. At the beginning. Chapter 3 Section 2 World History Mrs. Deborah Thompson. Hebrew Kingdoms and Captivity World History I Heritage High School World History I Heritage High School. Scripture Studies Chapter 12 The Divided Kingdom. Israel and Her King. God promises that he will bless the people of Israel and establish their nation, for one purpose. The Story-Line of Christian Prophetic Rhetorolect LESSON 4: ISAIAH AS A RESOURCE FOR JOHN THE BAPTIST AND THE BIRTH OF JESUS The Christian prophetic story-line. Dem Bones, Dem Bones David Venable April 29, 2007. In the little village of Bethlehem there lay a child one day. ELIJAH’S DEPRESSION 1 Kings 19 1 Now Ahab told Jezebel everything Elijah had done and how he had killed all the prophets with the sword. 2 So Jezebel. Maximum Load Limit!. Elijah’s Maximum Load Limit! 1 Kings 19. 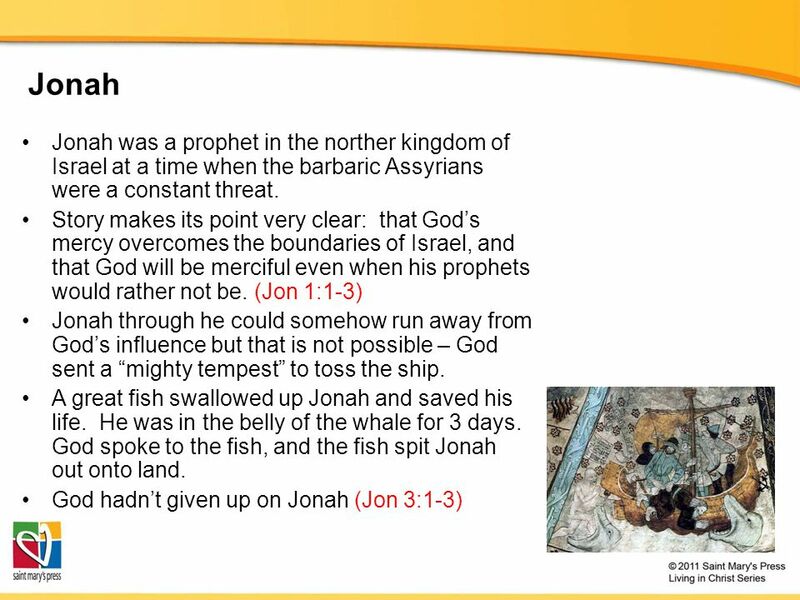 Chapter 1Chapter 2Chapter 3Chapter 4 Assyrian Theology The Book of Jonah. 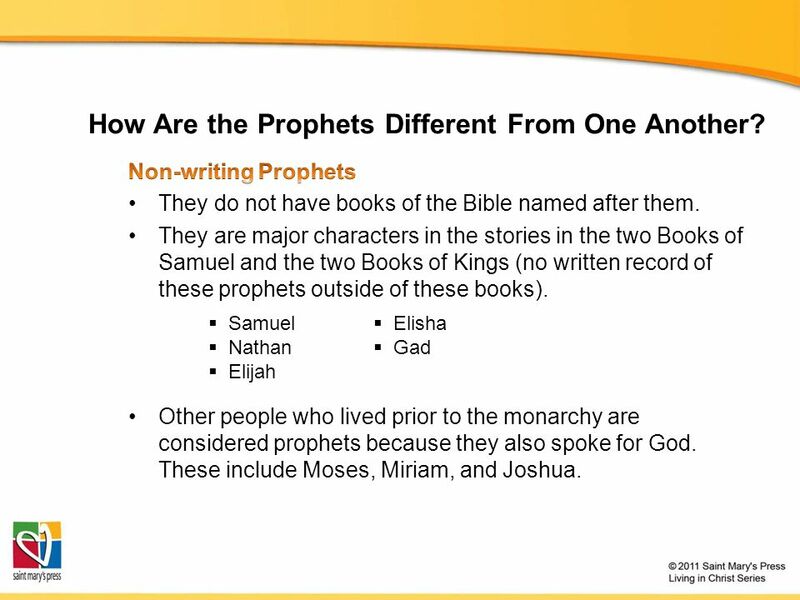 Elijah and Elisha Discipleship Relationships 1 Kings 19:12-21. FOURTH SUNDAY OF ADVENT -B- Music: Kyrie sV A reading from the second book of Samuel7: Once David had settled into his house and the. GOD SPEAKS: 18 For the L ORD is God, and he created the heavens and earth and put everything in place. He made the world to be lived in, not to be a place. Celebrate the arrival of Jesus with us this season! Conquest and Exile Chapter 13 The fall of the south. Pastor Timothy Hinkle August 21, He Called Us Out! Exodus 14: Then Moses stretched out his hand over the sea; and the LORD caused the sea. “The Most High Rules in the Kingdom of Men” Daniel 4:19: “Then Daniel, whose name was Belteshazzar, was astonished for a time, and his thoughts troubled. Seek To go in quest of by searching. Looking for, longing for something. To try to acquire or obtain something. To enquire about or request, ask for help. Life & Times of Hezekiah Pt. 3 12. Review Reformation.